“AE” Model 99-N (19mm) and 100-N (25mm) swing/recess type, manual operated fire hosereel are manufactured within a strict quality controlled environment to ISO 9001:2008 and conformed to BS EN 671-1 specifications. The elegant design with double pivoted joints allows the installer the flexibility to fix the hosereel at the back wall or at either left or right side wall mounting. This installation flexibility greatly helps designersin deciding the appropriate size of the recessed hosereel compartment, especially in areas where space constraints are critical. Another unique feature in the hosereel design isthe “slide-in” wall mounting bracket which is a separate strong and rigid galvanised steel bracket that is initially installed onto the concrete wall without the hosereel. The complete hosereel is then “slide in” from the top and sits in a fitting and rigid position. The water supply piping is then connected to the inlet of the hosereel. The materials used in the manufacture of the fire hosereel are of the highest quality such as the combination of Grade 304 stainless steel, high grade aluminium alloy and/or LG2 gunmetal waterway assembly all of which are corrosion resistant and of high impactstrength. 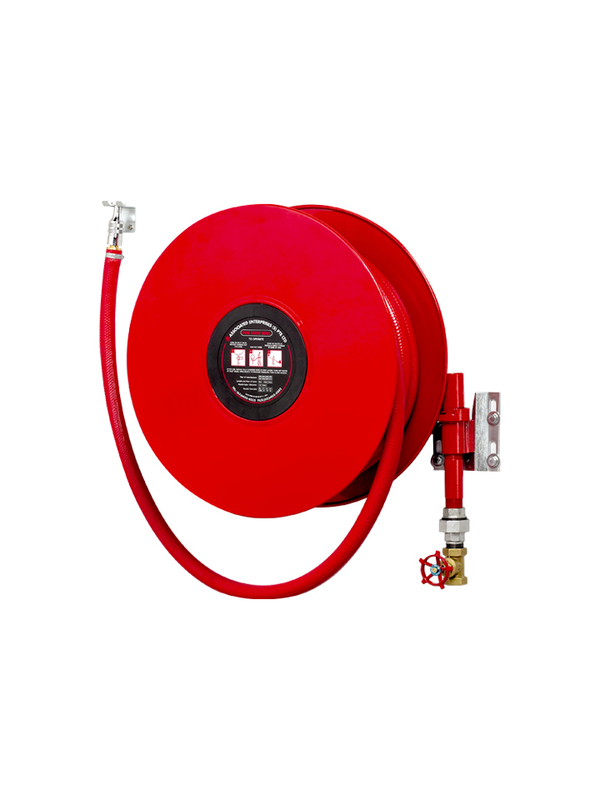 The fire reel discs are pressed steel of 1.2mm thickness and epoxy/polyester powder coated. The hub is made of deep drawn galvanised steel. • Elegant and compact design. • Easy and flexible installation. • Reliable performance with minimum maintenance. • 30 metre long, EN 694 hose. • Open/shut, 6mm orifice, Jet Stream nozzle. • Zinc plated hose clamps. • Galvanised steel nozzle holder. • Galvanised iron union coupling fitting.